Cadillac Fairview (CF) and the Investment Management Corporation of Ontario (on behalf of its client Ontario Pension Board) announced today that TD Bank Group (TD) has signed a long-term lease agreement, which will see TD occupy 840,000 square feet across 33 floors at 160 Front Street West. As part of the transaction, which remains subject to customary closing procedures, TD will take part ownership in the building. 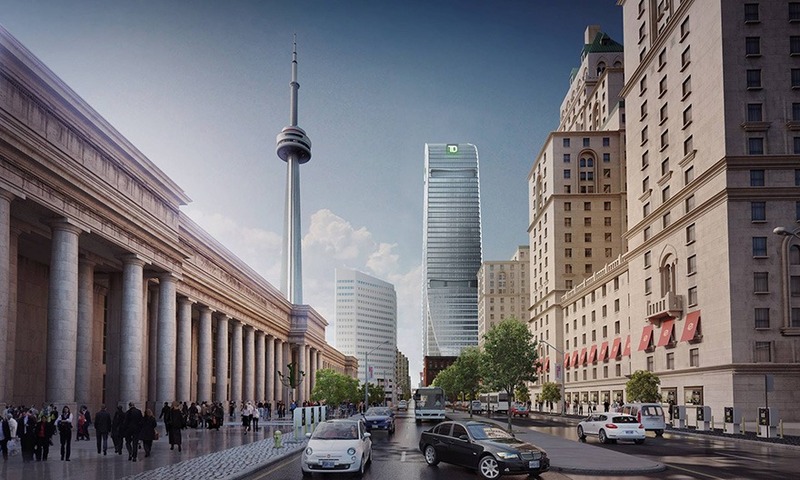 For TD, the investment is a strategic decision that reflects the bank’s strong balance sheet as well as the long-term outlook for corporate real estate in the downtown core. Cadillac Fairview currently has $1.5B of major office projects under development, including the $479 million building at 16 Street in Toronto, which is a joint project with IMCO, the $200 million BMO Campus at CF Toronto Eaton Centre, and the $60 million revitalization of 2 Queen Street West in Toronto. Cadillac Fairview is one of the largest owners, operators and developers of best-in-class office, retail and mixed-use properties in North America. The Cadillac Fairview portfolio is owned by the Ontario Teachers’ Pension Plan, a diversified global investor which administers the pensions of more than 323,000 active and retired school teachers. The real estate portfolio also includes investments in retail, mixed-use and industrial real estate in Brazil, Colombia andMexico. The Investment Management Corporation of Ontario (IMCO) manages a $61.6 billion portfolio that spans multiple asset classes and value-add strategies that are designed to meet the important financial objectives of public sector clients in Ontario. IMCO’s mandate is to provide broader public-sector institutions with investment management services, including portfolio construction advice, better access to a diverse range of asset classes and sophisticated risk management capabilities. IMCO is an independent organization, operating at arm’s length from government and guided by a highly experienced and professional Board of Directors. For more information, visit www.imcoinvest.comand follow us on Twitter @IMCOinvest. The Toronto-Dominion Bank and its subsidiaries are collectively known as TD Bank Group (“TD” or the “Bank”). TD is the sixth largest bank in North America by branches and serves more than 25 million customers in three key businesses operating in a number of locations in financial centres around the globe: Canadian Retail, including TD Canada Trust, TD Auto Finance Canada, TD Wealth (Canada), TD Direct Investing, and TD Insurance; U.S. Retail, including TD Bank, America’s Most Convenient Bank®, TD Auto Finance U.S., TD Wealth (U.S.), and an investment in TD Ameritrade; and Wholesale Banking, including TD Securities. TD also ranks among the world’s leading online financial services firms, with more than 12 million active online and mobile customers. TD had CDN$1.3 trillion in assets on January 31, 2019. The Toronto-Dominion Bank trades under the symbol “TD” on the Toronto and New York Stock Exchanges.